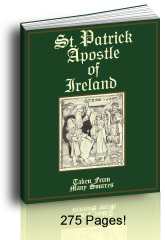 Catholic catechism ideas abound in saint stories and other Catholic books. First, you want your catechism time concise, yet useful and memorable. Second, you want to make the class fun while avoiding fluff. I did anyway. Who has time for more? You do not really need a bunch of activities to fill the time. I try to remember this and limit how much busy work I give. When you add good stories to the catechism questions that apply to the topic, catechism class comes alive and the kids remember better. Prayer and a good catechism are key to keeping the Faith through life. I really like having the children read real stories of the saints, as opposed to using text books. The most edifying books tell the real story. Good books offer the best catechism ideas in the pursuit of a joyful and truthful catechism course. 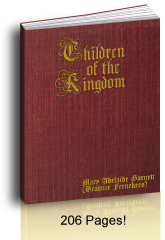 They fill in the story for all of us, but most especially with a Catholic catechism for children. We have found several good Catholic books that are excellent for First Communion and Confirmation preparation for classroom or Catholic home school use. Our favorite books are the ones that tell the Bible story and the stories of Catholic saints. Older students appreciate a good Catholic history book, too, like the Spanish heroes El Cid or Saint Fernando III and the martyr/president of Equador, Garcia Moreno . For starters your youngest children can color pictures that are related to the lesson of the day or add the stories of the saints to their play time by pretending to be their favorite saints or Bible heroes. Your older children can practice their handwriting and color the more detailed stained glass coloring pages you'll find on our site. You'll love our coloring pages to print. Generally children need to review through the years so our copybooks are helpful there. See below. If you're teaching your children about the Mass, set them up with a way to play Mass. Gather household trinkets to pretend that they are the main vessels on the altar, books, and flowers. Even if they do not really get their parts right, the very act of pretending to be pious helps kids understand more about what happens at Mass. Girls love to dress up, put on veils, take their baby dolls to have the priest baptize their babies. They love to be the Sister who takes care of the altar and places flowers there. These are all great times to include what the children are learning in catechism like the sacraments, prayers, and hymns. 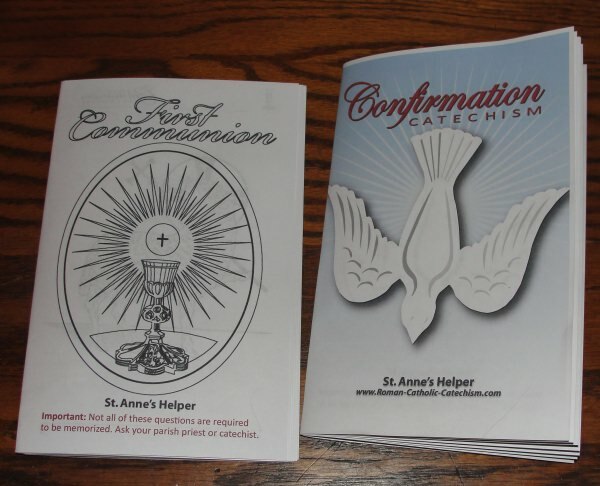 For studying the First Communion Catechism, you can have your children practice the Baltimore Catechism answers with our audio recording, read the booklet, practice writing the answers, or color Communion coloring pages. Then there are times when you can help the children practice at home and then at church what they'll do for their First Communion. Quietly praying the Rosary every night is excellent practice for being quiet in church. Practice going to Confession with Mom or Dad as the confessor, keeping everything serious and solemn. Show the children the actual confessionals at church when the church is not busy. Let them kneel down where they'll confess. This is what the Sisters used to do for us. Going to the Blessing of Throats on the feast of St. Blase and receiving ashes on Ash Wednesday are good times to practice walking in procession, folding your hands well, and kneeling at the altar rail. Do be sure to attend these events the year of your child's First Communion. 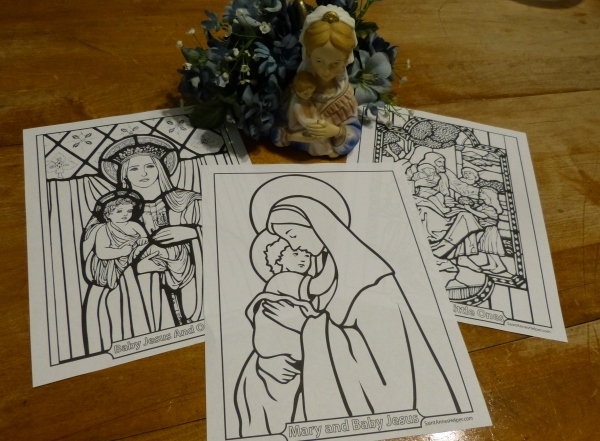 Print Communion coloring pages for some fun moments. The youth catechism you'll trust most is the Baltimore Catechism No. 2. Once your child has studied it, he or she will be ready for Confirmation. If you want practice worksheets, quizzes, audio, and a printable booklet see our order page for Confirmation catechism products that teach the main Baltimore questions and answers for Confirmation. Each product links to a descriptive page. Your oldest children can read solid Catholic books and pursue Catholic spiritual reading. Homeschool catechism class is often as much a learning experience for parents as it is for children. So many times you need to catch up on the catechism that you did not have in school, or you realize so much more when you're teaching your own kids. This is a great time to brush up or catch up. Simply read ahead to stay one page ahead of the children. Using a whiteboard will be a huge help to you. It is for us. We use a whiteboard to model the words that the children may have trouble spelling. For very young students this is practically every word, so it is nice to also have the text already printed on the copywork pages to give a better reference as to where to write and what to write. Not expensive at all with a bit of ingenuity. An 8' x 4' white board is one of the great Catholic catechism ideas we have found to make the teaching easier and more explicit. They can be less than $20 if you get melamine coated Masonite from the home improvement stores. Frame yours, if you like, with inexpensive trim. You can use a yardstick and a blue "Super Sharpie twin tip" to mark the baselines on your whiteboard and a red one for the left margin. Use the center five feet and keep the right free for suffixes and the left free for prefixes that you'll teach as you go. Over many years the Super Sharpie lines would disappear as the Expo dry erase pens would slowly remove the lines, yet this stopped after about three months. So, we learned to freshen our lines in June so they lasted longer after a September start. Having the lines on the board was such a benefit to our little ones that it was worth the extra effort. With the dictation approach the teacher does not write the word first unless the student has trouble with a new word. The teacher reminds the student of a particular phonics rule or then models how a big word is spelled. This takes longer, but rewards the student with life-long spelling skills. This is great for parish classrooms or for Catholic homeschool. 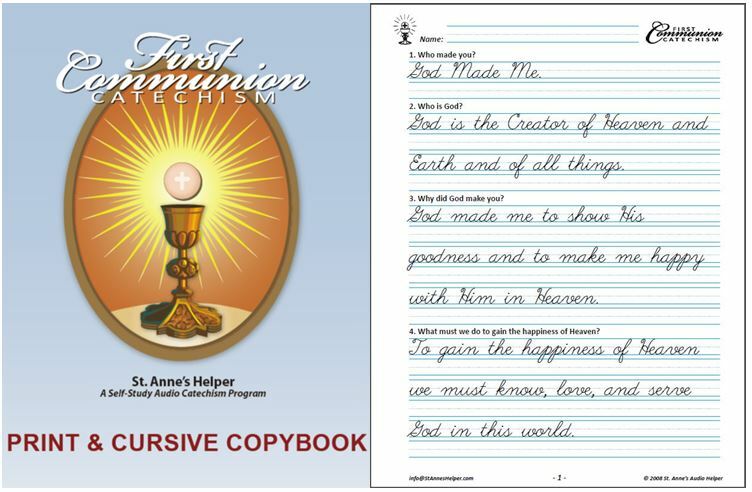 St. Anne's Catechism Copybooks are reprintable and have both manuscript and cursive PDF versions. 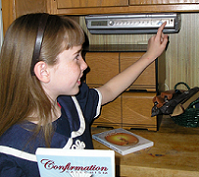 The Communion book is great for young children and the Confirmation book is helpful afterward. Each book may be printed for as many students as needed, or you can print individual pages. This way your lesson plan is simply to print the next pages. Also, there's no need to buy a new copybook for successive students or the rest of your children. This is a huge savings for homeschooling families. All our printable downloads are also interactive so that means that you can copy the file to your child's account and he can type the answers. You can save printing paper and ink, or you can print the final copy. Kids love seeing their work come from the printer! I treasure that the children can learn better penmanship and I like having them keep their work in a binder. Now I'm well enough set up that I can print and bind them with the new plastic spiral binding. Staples and office stores like that can print the books quickly and cheaply. If you're doing this for several children, consider using their favorite color of the spiral bindings that are available. This is a huge help when each goes to find his own book. Otherwise, for Communion I like white; and for Confirmation, red or black are good colors. Little ones memorize their prayers. Older children memorize their catechism answers. Adults learn or review the catechism. One of the ideas that is special to our site is that we offer you help with the children memorizing their catechism questions and answers. 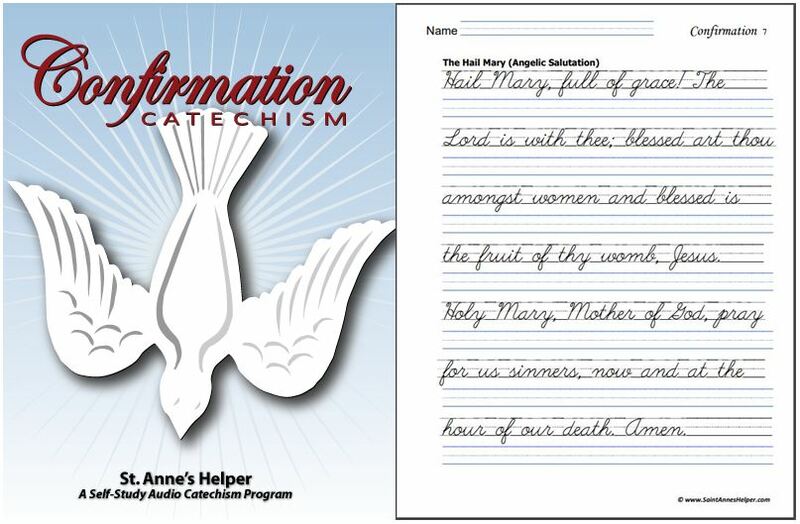 St. Anne's Audio Catechism CDs and downloads are "enhanced"which means that there are two files: the audio and the printable text from the same CD or download. They are easy for a child to use since each question on the text of the CD matches the track number of the same Audio CD. This feature alone makes this one of the best Catholic catechism ideas we've seen for any catechism class. They're like having a tutor on hand to help with review. See them on our order page here. The St. Anne's Audio Catechism CDs are packaged in white flexible DVD boxes for long lasting use! These boxes will withstand many openings, many drops and falls, and even some PBJ! Another choice available is to order online and download our Catholic audio books or Catholic ebooks immediately. Or the Catholic feast days - saints days and memorials.